I went to an Orthodox Jewish wedding and what did I find in the midst of all that sushi and all that brisket? TOSTONES! 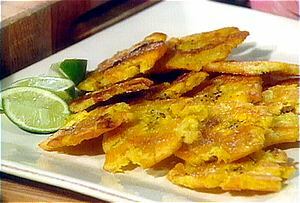 TOSTONES! TOSTONES! I overdosed on them and smiled like the Cheshire cat. I never knew they had a name! We just called them fried plantains. Dude, this is awesomesauce. Also, is it sacrilege that I prefer them with sour cream or whipped cream over table cream? I can't stand the stuff. We usually dip them in garlic sauce. My sister loves them with ketchup (like fries). Usually we only have tostones on Passover now because if we had them more often, we would die from a heart attack from the oily friedness of it all. Much more often, we bake sweet yellow plantains and have maduros. We pour honey on those and sugar and all sorts of sweet stuff. maybe hanukkah tostones? hmmm . . we ought to add that to the hannukah menu — in addition to the bunuelos and a dreidl pinata. any more suggestions? No, no whipped cream on the tostones! Definately garlic. Mmmmm. Hungry now. I luv maduros. I saute them sometime in a lil brown sugar and butter. Yum. Debs, I'm making that its own post in a couple of weeks! Yum! we should have a special blessing for finding great recipes on the internet! I'm making plantain latkes AND potato latkes this year. YUM!! gracias, Deb. Oh wow, how are these different from fried plantains? In the few instances where Jews have been cooking carribbean food, in the samples I had, the results were horrific. I am glad you found a good specimen! Yeah, fried plantains. Though depending on the type (green or yello), they get called different things. Same names if you bake them too but if you boil them, well, that's a whole other ball game. There were good but plantains don't keep well. That's why it's so hard to have them for Shabbat unless you literally eat them like 10-15 minutes later which never happens. And these were fresh but not super fresh. But these Jewish caterers know what they're doing with their plantains. At my wedding, they were just divine!